Ohio's streams flow into Lake Erie to the north, and the Ohio River to the south and southeast. There are more than 400 miles of waterways along Ohio's southern border that can be used by commercial boats. Ohio has 45 watersheds. Ohio has eight Lake Erie Ports. Ohio has more than 3,300 named rivers and streams and an equally large number of smaller unnamed branches. Today, there are above 60,000 lakes, reservoirs, and ponds in Ohio. The Lake Erie shoreline makes Ohio part of the largest fresh water navigation system in the world, the Great Lakes. Today, the Great Lakes connect Ohio to the Atlantic Ocean and world markets by way of the St. Lawrence Seaway. One hundred years ago, the connection was by way of Lake Erie and the Erie Canal, which connects Lake Erie with the Hudson River and New York City's harbor. About one-fourth of Ohio's surface area drains to Lake Erie. Thirteen of the state's major streams and rivers flow directly into Lake Erie. About three-fourths of Ohio's surface area is part of the Ohio River drainage system. Thirty-one of the state's major streams and rivers flow directly into the Ohio River. During the 1800s Ohio built canals that connected lake Erie and the Ohio River. 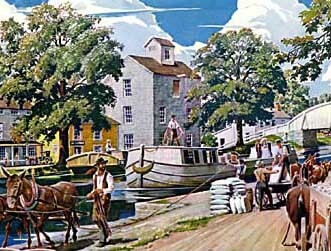 The canal system created new markets for Ohio's goods, reduced the cost of shipping goods from the East, increased the number of people moving into the state, and encouraged the building of new towns. In the early 1820s, construction of the Erie Canal in New York State was almost finished. In 1822, the Ohio legislature created a commission to plan a canal system. This would connect Ohio, by way of Lake Erie, with the Erie Canal in New York State and with the eastern markets. It also would connect Ohio with New Orleans by way of the Ohio River and the Mississippi River. Before the canals were built the only way to ship quantities of goods from New York City to New Orleans was by ocean. With the new canals, boats could carry people and goods by inland water from New York City to New Orleans. Alfred Kelly was Ohio's Canal Commissioner from 1823 to 1835. He was responsible for Ohio's early success with canals.In 1825, the Ohio General Assembly authorized the building of two canals. The Major project was the Ohio and Erie Canal, twisting from Cleveland to Portsmouth through the most heavily populated areas of central Ohio. The shorter Miami Canal was approved to serve important business areas in southwest Ohio by linking Dayton with Cincinnati. The legislature promised that this canal would be connected to Lake Erie as northwestern Ohio was settled and developed. Ohio's canal system was the largest public project in the state's early history. The two canals and their many branches connected much of Ohio's interior to agricultural and commercial markets in the East. The canals also made shipping to New Orleans by way of the Ohio and Mississippi Rivers available to many of Ohio's farmers and businesses.